A healthy, low-calorie hug in a bowl – it’s equally as good made with large prawns instead of chicken. In a pan, gently fry 2 shallots, finely sliced, 2 red chillies, finely sliced, and a 5cm piece stem ginger, sliced, in 1 tsp vegetable oil for 2 minutes. Add 2 lemongrass stalks, finely chopped, 2-3 chicken breasts, sliced, 600ml chicken stock and bring to a simmer. Stir in 2 tbsp fish sauce, 1 tbsp soft brown sugar and simmer for 10 minutes, until the chicken is cooked. Add a few handfuls baby leaf spinach, 200ml coconut milk and the juice of 2 limes. Warm until the spinach wilts. 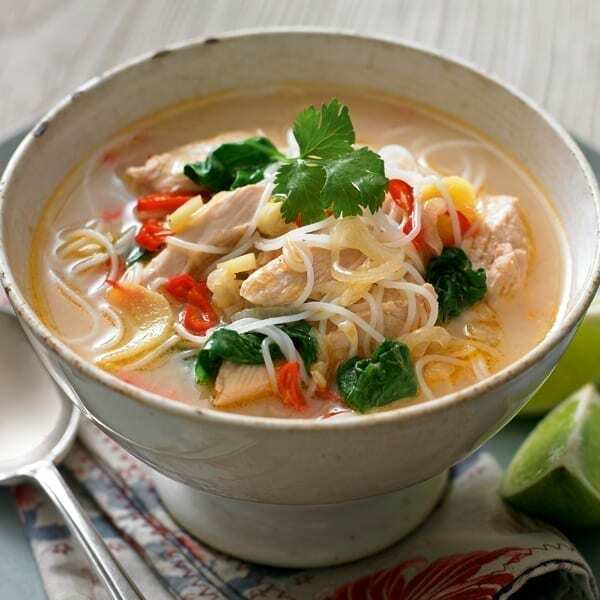 Cook 2 bundles thin rice noodles according to pack instructions and stir into the laksa. Divide between bowls and garnish each with a fresh coriander sprig and lime wedges. Id have to agree with Tina’s comment below. It was nice but either too much chicken stock or not enough coconut milk, and it needed to be thicker. Really lovely and fresh but too much chicken stock and needs to be a little thicker.